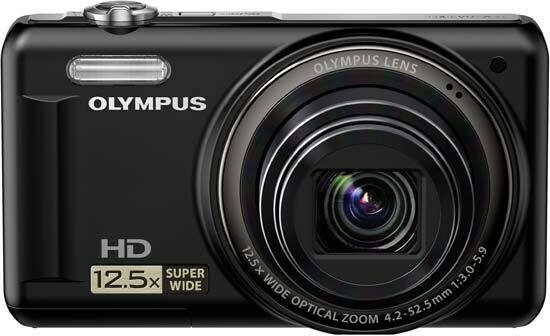 The Olympus VR-320 is a pocketable 14-megapixel travelzoom camera that won't break the bank. Featuring a 12.5x optical zoom, the VR-320 also offers dual image stabilisation, 720p HD movie capture, 3-inch LCD screen, a 1cm super macro mode, range of Magic Filters, auto-focus tracking and Intelligent Auto Mode. The Olympus VR-320 is available now in silver, black, red and blue, officially priced at £159.99 / $179.99 in the UK and the US, respectively. Not got much to spend but still want a broad focal range? Those looking for a budget travel zoom, or 'compact superzoom', may well be tempted by the appearance of Olympus' VR-320, which offers a headline 14 effective megapixel resolution from a 14.5MP, 1/2.3-inch CCD sensor. For, in spite of being the regulation pocket size, it boasts a better than average 12.5x optical zoom, plus an unassuming build lent a sophisticated sheen by the matt black finish of our review sample (silver, red and dark blue models also available). Its manufacturer claims a metal body, but by the body's 'thin' feel we'd have guessed plastic. Plus, it somehow feels broader than its maker's claimed depth of 19.3mm at its slimmest point. Nevertheless overall this compact feels reasonably weighty and sits well in the palm, overall dimensions with full protrusions being 100.6x58.2x28.5mm. 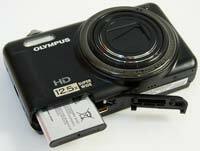 It weighs a manageable 158g with battery and SD or SDHC card loaded. There's also a modest 33MB internal capacity if you forget to load a card. The VR-320 slots into a VR range that surfaced at the start of the year and also includes the VR-310. The VR-320 offers a focal range the equivalent of 24mm to 300mm in 35mm film terms (the VR-310 'just' offers a 10x zoom), so there's the opportunity to squeeze everything from candid close ups to group portraits into shot, plus - theoretically - drag the faraway that much closer at the telephoto end. Suggested retail price is currently £119.99, the 10x VR-310 by contrast hitting the sweet spot of £99. Both are more affordable alternatives to Olympus' official travel zoom series in the SZ models; the SZ-20 being the nearest match to the VR-320 for spec alone, and, if you look at our image quality box, for performance in that respect too. There's not much that's show-y off-y about the Olympus VR-320, with its simplistic menu screens and pared back operation. However we do get HD movies and a dedicated back plate button with which to commence their recording, but resolution is the lesser 1280x720 pixels and sound is unsurprisingly mono. Also, the zoom stays put when filming has commenced, unless you turn off the ability to record accompanying audio. It's a slightly mystifying choice, as the sound of the zoom making its adjustments is not particularly loud or irritating on this model. Nevertheless that zoom reach is supported by dual image stabilization (mechanical and software enhanced), Olympus has included a smattering of seven Magic Filters on board - the 'junior version' of the Art Filters to be found on the Pen models - plus the point and shoot, subject recognising iAuto mode is included alongside Program mode. There's no getting away from the fact however that this is a snapshot camera, pure and simple, with its photos and video composed and reviewed via 3-inch, 230k-dot, 4:3 aspect ratio LCD back screen. It's clear enough to se what you're doing even in bright sunlight, but we sometimes struggled to determine whether a shot was properly focused without having to zoom in on detail to confirm, achieved via the zoom lever ergonomically encircling the shutter release button. Outwardly there's not a massive attempt made here to disguise the fact that the VR-320 is a budget camera - the design is functional rather than fancy - although everything, bar a dedicated physical mode wheel that would have further simplified operation, is in the right place. At the front of the Olympus proceedings are naturally dominated by that zoom lens, which is largely retracted within the body when the camera is inactive. The faceplate is not completely flat however, thanks to a series of surrounding rings that 'build' around the lens giving it extra prominence. On the outermost ring is included a built-in microphone, with the speaker being inexplicably located at the camera's base, which means if you're cupping the unit in your hand the audio is hard to hear. Top right of the lens, if still viewing the VR-320's faceplate, we find a small indicator lamp for the AF assist/self timer, and, to the left of the lens, a lozenge shaped window for the built-in flash. In our practical experience, this was not located sufficiently far enough away from the slender concession to a handgrip at the front for fingertips to avoid inadvertently straying in front of the flash. The problem is exacerbated if you hand the camera to someone else to take your portrait, and so on occasion we ended up with flash portraits where one half of the frame was well exposed, the other half in shadow. If Olympus extended the raised 'grip' so that it ran from top to bottom and shifted the flash in slightly, this might prove to be less of an issue. The top of the camera presents an equally straightforward layout, with small on/off button, raised shutter release button plus encircling zoom lever set into a chrome strip that runs the length of the top plate. Being mirrored, this strip inevitably attracts fingerprints, so you'll be constantly wiping it clean with the hem of your shirt. The raised shutter release button ensures that it falls neatly under your forefinger as the camera is gripped in the right hand, with the ability to slide the self same finger over to the zoom lever and make framing adjustments without taking an eye off the screen or your subject. Provided the photographer has first set time and date and selected their region, the camera can be lined up ready for the first shot from cold in all of a couple of seconds. The VR-320 can also be fortunately set so that it remembers the previous setting selected if turning it off and back on again. This saves time, say, if you want to pre-select any of the Magic Filters or scene modes for a shot you've got in mind that's coming up, and you want to ensure the camera's prepped and ready. The other shooting modes here are Program, Scene, Panorama, and iAuto, with the modest available settings in each mode shown on a toolbar that extends below and runs down the right hand edge of the screen. Press the shutter release button halfway and focus and exposure is determined in a second or so, the screen very briefly showing the adjustment before the familiar green AF square appears on screen. Go on to take the shot and with minimal shutter delay a full 14 megapixel JPEG is committed to memory in the standard 2-3 seconds, the screen briefly blanking out before freezing with an image of the captured shot. As we note, such timings are all pretty average for a camera in this Olympus' point and shoot class. Turning our attention to the back of this compact, and once again the LCD screen dominates the available space, with buttons located to its right where they fall under the thumb of the right hand. The layout here is once more spare and simplistic, the aforementioned camcorder-like red video record button located near the top right hand edge. Press this whatever stills shooting mode might be in play at the time and the regular screen display narrows, black bands cropping it top and bottom to provide a widescreen ratio image. It takes a couple of seconds' wait for recording to actually commence however. And, as explained earlier, the user can shoot video without sound but use of the zoom, or with sound but the framing fixed/frozen at the point it was before filming commenced. Video in the case of the VR-320 is then probably best viewed as an add-on for occasional use rather than joint or main reason for purchase. Unsurprisingly, given the less than Full HD resolution, mono sound and inexpensive price tag, there's no HDMI output here for connecting directly to a flat panel TV; just a single port provided at the base to which the supplied USB cable or separate standard AV lead - both supplied in the box - is attached. There is a separate setting governing video to be found among the six menu folders. This offers control over image size, frame rate, and allows image stabilization to be turned off or on during recording, and ditto sound, as discussed. The choice of image size is either the top quality 720p, VGA (640x480) or QVGA (320x240). The frame rate can be left at the top setting of 30fps or swapped to 15fps as desired: all very straightforward. The button below the backplate video record button is identically sized and obviously for retrieving images from the camera memory - in other words playback. Press the menu button in this setting and the menu folders are of the same number and presented in the same order as when pressing 'menu' in capture mode. Tabbing down to the triangular 'play' icon provides the options of kick starting a slide show, editing images in-camera (downsizing, cropping, adding audio or carrying out an automatic lighting or red eye correction), plus erasing, setting a print order, locking against accidental deletion or rotating shots. Below the playback button is the largest control on the VR-320's back, which is the familiar four-way control pad. At 12 o'clock here we have a setting marked 'info'. Give this a press in capture mode and the display is altered however, losing the on-screen icons with the exception of an indication of whichever shooting mode has been selected, or calling up a nine zone compositional grid for anyone wishing to practice the photographic Rule of Thirds. In playback however a press of 'info' naturally brings up an image's capture data, including shutter speed, aperture, exposure and the like. At the centre of the dial are a self explanatory 'OK' button for implementing any setting changes required during function or menu selections, while at the bottom of the dial at six o'clock is a handy delete icon, to save having to wade into playback menus to dispatch obviously duff images. The menu button we've touched on, which sits below the control pad, where it's joined by a button detailed with an enigmatic question mark. A press of 'Menu' as we've detailed gives access to six folders of digital 'goodness'. From the top we have two stills capture mode folders - allowing the adjustment of image size and quality, the activation of digital zoom, image stabilizer, AF illuminator and the like - the, as the third setting down, the aforementioned video mode folder. Beneath this we have the already touched upon playback mode, plus two Set Up menu screens, for formatting the card in use, adjusting function sound volume, screen brightness and all the expected regulars. Press the '?' button when highlighting any of these options, keep the button held down, and a brief text explanation will appear on screen. For example, in the case of altering monitor settings, we get: 'Adjusts the brightness and contrast of the monitor'. Of course you might need to read the manual to discover how to use the '?' button, or why it's there, but once discovered, use of it goes some way to avoiding the need to actually read said tome. As usual we get the cursory Quick Start manual in the box, with the full text on CD only. While the right hand flank of the camera - if continuing to view the VR-320 from the back - features an eyelet for attaching a wrist strap, the left hand side is devoid of any features except the customary pair of placement screws. 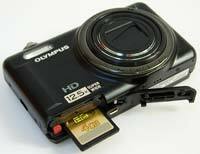 The base of the Olympus meanwhile features a central screw thread for attaching a tripod, plus a slide-open plastic cover protecting the compartment housing the rechargeable lithium ion battery and optional SD/SDHC card. Tucked just behind this is an unprotected/exposed port for attaching the supplied cabling.